At last the student has finally become the teacher…or at least he would if he wasn’t so riddled with self-doubt. As with the previous films in the Kung Fu Panda franchise, the third entry in the series finds the loveable Po (Jack Black) struggling with his confidence. Although he has proven himself to be worthy of the Dragon Warrior moniker, Po has problems adapting to the responsibilities that come with the title. Given the task by his shifu (Dustin Hoffman) to train his peers, Po quickly realizes that he may not have the leadership skills needed to take his team’s martial arts skills to the next level. Complicating matters further for the easy-going hero is the reemergence of both his father, Li (Bryan Cranston), and a Chi-stealing villain name Kai (J.K. Simmons). Learning that pandas may hold the secret to mastering “Chi,” Po embarks on a journey to a secret village in the mountains that will open his eyes to a panda heritage he never knew existed. Kung Fu Panda 3 does not deviate that much from the franchise’s established structure. Po doubts himself, learns some valuable lessons from those around him, and realizes that he indeed had what it takes inside him all along. Unlike the previous sequel, this latest film does not merely rest on its laurels. Directors Alessandro Carloni and Jennifer Yuh bring a wonderful sense of mysticism to the proceedings. It allows the film to not only take some comedic jabs at iconic martial arts films, but also connects on a deeper level than its predecessor. The emphasis on Chi also opens up new avenues for the film from both an action and animation standpoint. It can be argued that Carloni and Yuh have crafted the best looking film in the series to date. The fluid and beautiful imagery helps to bring added life to the father-son narrative at the film’s core. It is in the interplay between Po, Li, and Po’s adopted father Mr. Ping (James Hong), where the film offers some of its most humorous moments. However, in all its light-hearted sequences, the film never loses sight of its overall message. One does not need to follow a particular path in order to inspire others. Carloni and Yuh want those young and old to feel empowered by their own abilities. 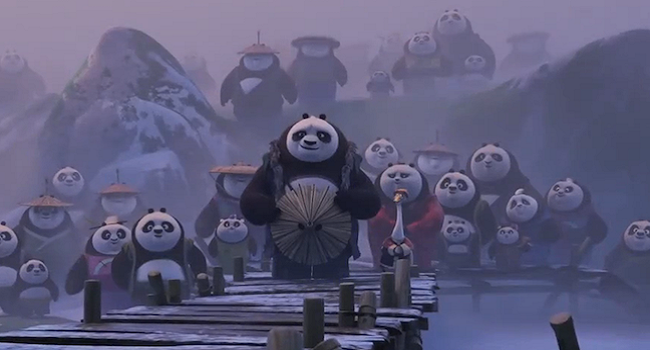 Just as Po, Li, and Mr. Ping must learn to navigate each other under these new circumstances in their own way, Kung Fu Panda 3 succeeds in conveying the importance of finding ways to utilize one’s unique strengths. My kids never latched onto this series and so I haven’t seen them either. But I know there is a big following and I feel I need to check it out. I would say that this one and the original are worth seeing. I had several issues with number 2, but a lot of those were related to problems that I have with many animated sequels in general. I totally agree with you! This movie was such a pleasant surprise! Just when you think the series has run out of ideas, they hit you with this pleasurable romp. I haven’t seen this entry of the series so far but I love the fact that the first film celebrates the idea of just being yourself as well as provide the importance of those who can teach you to do that. Even if it means finding a way to showcases those skills and teach them in unconventional ways to someone else where they wouldn’t have to know a million moves to defeat against someone but rather use what you have and make the most of it. The second film also had similar ideas as it does play into that sense of self-being but also in the need of how one is trying to find himself and who he is while not wanting to abandon the parental figure who had raised him. It also had this anti-war message that I felt was very simple in the film’s climax was spot-on. I hope to see this very soon. If you enjoyed the previous films then you will like this one. Frankly, I think it is a vast improvement over the second film.